I am joining in my beloved Britmums linky. I've missed them so much. I've chosen to go back in time 5 years. It's strange looking back at LBJ (Life Before Joseph). I guess many parents feel the same, that once you have a child, they consume your life, and its hard to fathom what life was like before. 5 years ago Amy Winehouse's album Back to Black was the must have, must listen to album. We loved the Kaiser Chiefs and Scouting for Girls. In music terms it seems such along time ago! This was me in the February of 2007. Corey and I had got enaged in the December of the previous year, and he was anxious to take me to Luxembourg and Germany to meet his family. That's me on the train to Luxembourg. We wanted to save money so we got the coach to Belgium the train to Luxembourg and then on to Germany. It was quite a trip. I am 34 in that photo, I am newly engaged, in love, we are reasonably well off, in good jobs, everything just seemed so perfect and I couldn't wait for the next adventure. This is us, all loved up in Luxumbourg. Awwwww! Corey never thought he would get married, and we always joke that he is gripping on to me so I don't run away. Later in the year we did an amazing backpackers adventure with two friends, Martin and Trish (not a couple), in Sicily. It was a really wonderful holiday and I learnt a lot about myself and Corey too. We love getting out and travelling and seeing the place through local's eyes. 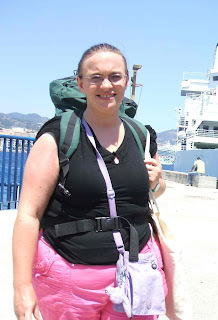 I look quite the Aussie backpacker there! We decided to go to mainland Italy, we only stayed a couple of hours! The boat trip was really a car ferry, not a tourist trip, and they weren't really prepared for foot passengers, I had to leap over the water to get on to the boat! At Santa Stefano di Camastra station, wating for a train, in the sunshine with Corey and Trish, such happy times. 5 years ago, we were free, travelling, getting ready for our wedding the next year, and enjoying life together. I think 2007 really was the year of freedom for us. The following year we had the madness of the wedding then shortly after I fell pregnant, and life would never, ever be the same again.